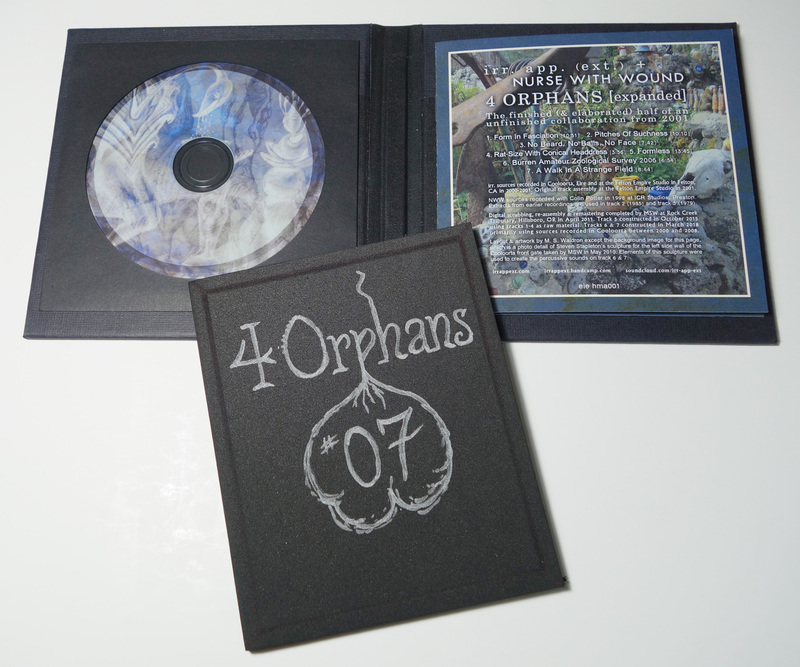 I’ve been working feverishly on the ‘4 Orphans’ handmade project, and although the edition is not 100% finished I’m just going to spill the beans about it now to see what kind of response I get. It’s only 8 weeks behind schedule, so I’m doing better than usual! But it was a particularly rough 8 weeks. I usually avoid doing pre-orders, but it’s so close to completion that it’ll barely be a pre-order for most people: about a week for the first 40 or so orders, and between 2-3 weeks for the rest. This is a handmade, hardbound-packaged CDR version of the irr. app. (ext. 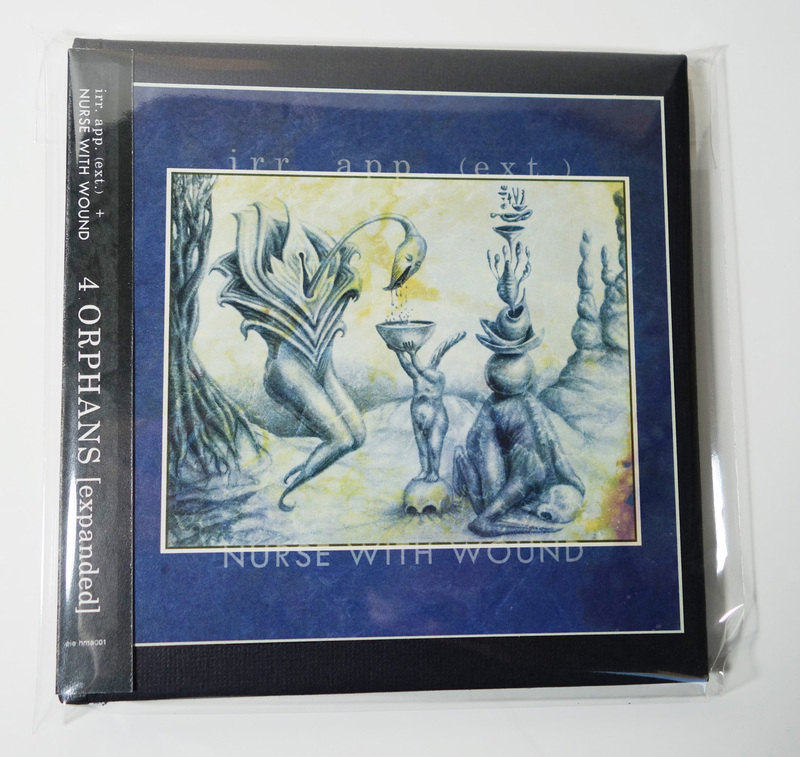 )/Nurse With Wound ‘4 Orphans’ collaboration. The disc includes all 4 original tracks, plus 3 additional tracks: ‘Formless’, a drastic reworking of the original sources which was created in 2015, and ‘Burren Amateur Zoological Survey 2006’ and ‘A Walk In A Strange Field’, two new tracks built almost entirely from recordings made at Cooloorta and in the Burren. This is almost 30 minutes of extra material, bringing the total duration to slightly over an hour. 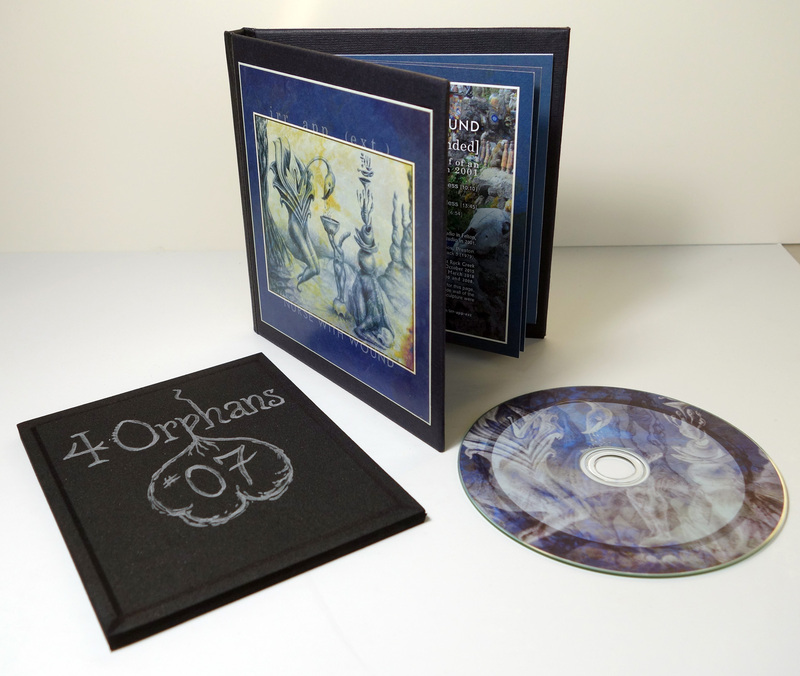 The packaging is a hardbound book-style cover containing a 7-page booklet with the full text about the origins of the project (as is included with the download version). 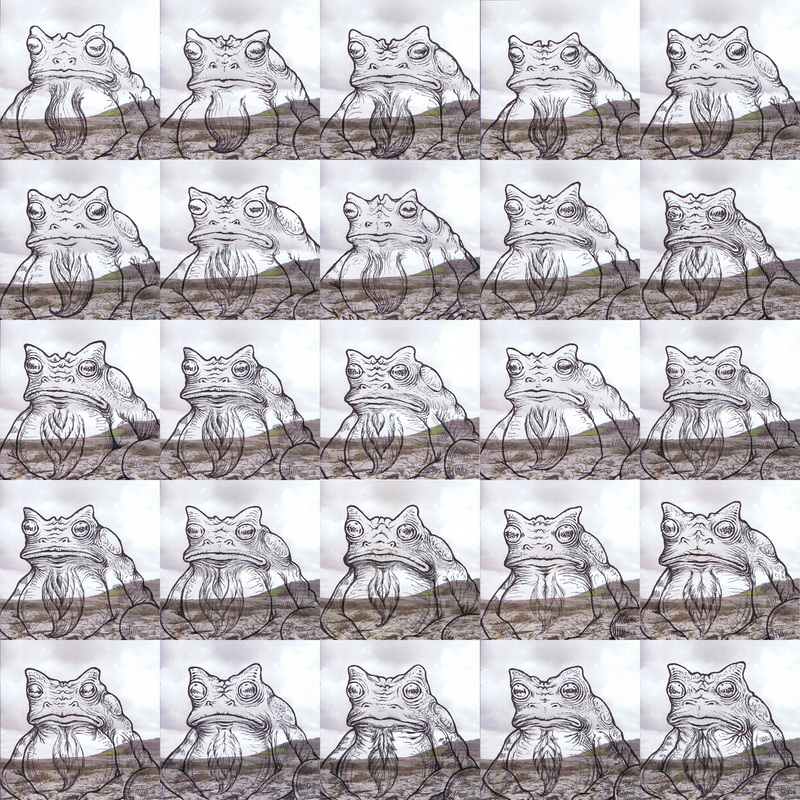 The last page of each booklet features an original ink drawing of ‘Bufo gillespianus’, the scarce & elusive Bearded Burren Toad, rendered on a photograph of it’s natural habitat around Mullach Mór (examples below). 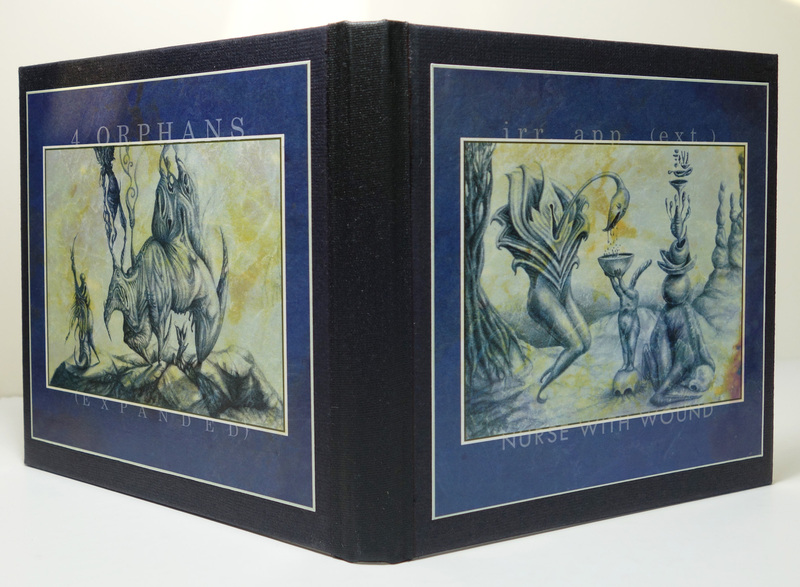 Also included is a comforting slab of black foam with the edition number & owner’s name hand-inscribed in silver (see photos). The edition number & owner’s name will also be written on the toad drawing page. The labour & materials for this project far (far) exceeded what I had anticipated, so I’m asking $40 per copy. This is more than I had intended to charge, but the main point of the project was to raise some funds while I recovered from my medical misfortunes, so I hope you’ll forgive the large-ish price tag this time around. I’m planning to do more handmade editions, but am experimenting with other methods & materials to try to keep the costs lower in the future. This first attempt was slightly rushed, and involved a steep learning curve and several missteps before I got everything figured out properly. The edition size is 85 copies. I have 45 of those just about ready to stroll out the door. Part of the reason for doing this as a pre-order is that I’m not sure of how much interest there will be (especially with the higher price). If only get 20 orders, then I can adjust the edition size down to 50; if I get 50 orders, I have the assembly procedures streamlined well enough now that I can get the remaining edition of 85 ready within a couple of weeks. The packaging is not factory-made: it is very much a hand-assembled item. I mention this again because there are the inevitable rough edges and irregularities unavoidable with a hand-made project, and I want everyone to be fully aware of what they’ll be getting. But I’ll also add that I put considerable effort & attention to detail into every aspect of this, and I think that results are very nice. After seeing the completed package, Steve, Colin and Andrew each gave me an unreservedly enthusiastic response. A few other details I feel I should mention. I added the foam piece because the the spine turned out a bit wider than was really necessary, and I wanted to add some support so the packaging didn’t get damaged during shipping. To make it more relevant than just padding, I added the hand-written name & number. THE FOAM IS NOT EDIBLE. I also added an obi strip (see photos above & below) so the title would be visible from the spine when placed on a shelf; this did not turn out in an entirely satisfactory way, since the printed paper I used does not crease as cleanly as I would have liked. I’ll investigate some better option next time, but I felt it’s a minor enough point to let pass on this one. The final detail is that I couldn’t find a resealable sleeve the right size that didn’t have the adhesive on the flap. My experience with sleeves having adhesive on the flap is that they inevitably (& annoyingly) stick to the packaging when you’re removing or replacing the item, and this can sometimes cause damage. To avoid this, I’ve trimmed off the adhesive strip and added my own adhesive tabs to the body of the sleeve, where sticking & damage are far less likely. If you want a copy, you can send $40 + postage via Paypal to irrappext@gmail.com. I’m not going to make a shop entry for this yet: I’m hoping it won’t be necessary and this announcement will be enough. For addresses in the US, the total with Media Mail postage is $44 ($4 for a 7 oz. package). If you want it sent Priority Mail instead, the total is $49. For overseas addresses, the postage is more complicated. The USPS has raised its international rates yet again, so a mere 7 oz. package now costs $14 to send to the UK or Europe. To lower this amount, I’m trying to work something out with a friend in the UK where I send him a Priority Mail bundle of 15 discs together and he’ll send along the individual packets. This would lower the per-disc cost for the bundle down to $5 each. The Royal Mail 2nd Class rates for a 7 oz. (198g) parcel appears to be £2.95 ($4), so that would bring the total UK postage down to $9 ($5 USPS + $4 Royal Mail), and I can knock a couple of dollars off to make a $47 total for the UK. Royal Mail International Standard rates to most European countries is £4.45 ($6), and again dropping off a couple dollars makes it $49 total for Europe. Delivery time will obviously be somewhat longer doing it this way. Of course, this only works if I get at least 15 overseas orders and my friend agrees to do it. So if you’re in the UK or Europe you can send $40 to reserve a copy of the disc, and I’ll contact you with postage details once I have 15 orders. If the bundle plan works, that will be an additional $7 (UK) or $9 (EU). If it doesn’t, both will be $14, and if anyone (understandably) finds that too expensive, I will refund their $40. Sorry this is so complicated! I hope to get a more straightforward strategy worked out before next time. Feel free to contact me with questions at irrappext@gmail.com. ~ by erratainexcelsis on 15 May 2018.